Shew ... what a LONG Thursday it was!!! I got up earlier than usual so I could get my workout done since I was going to be spending the majority of the day flying to St. Louis. The time change from West to East is so horrible! Not only does the long flight make me retain water (anyone else have that problem) .. it messes with sleep and meal timing ... AND considering I didn't land until well after midnight .. I kinda lost a FULL day!! But I not complaining! I'm lucky to have an opportunity to be a sponsored athlete with such an amazing company and I'm so excited to see everyone this weekend for Summer Smash 2016!! Speaking of workouts ... I changed my workout schedule a bit and ran my 6 set of sprints (HIIT) on Thursday instead of my usual "Field Day Friday" (lol...If you follow me on SnapChat ya know that is my routine.) I did this little switch in order to MAKE SURE I not only got in ALL my scheduled workouts while traveling .. but to make sure I still got in QUALITY workouts every single day this week! Traveling can throw you off if you don't plan ahead! I knew if I didn't switch it up and do cardio Thursday while I was still in Vegas ... that I'd be stuck doing indoor cardio at a gym. As much as I DO NOT like that field .. it is turf (so much easier on joints and shins than pavement or tracks) and gets my heart rate up there better than anything! It's a love/hate thing for sure, haha. I always feel like I can't make my legs GO fast enough!! But thanks to PREP WITH PURPOSE .. I have someone else motivating my every move! It's just the reminder I need to be thankful that -- I AM ABLE!! Okay .. speaking of being active in honor of others .... a little bad news. I am about to run out of people to pray for as part of #PrepWithPurpose :( I'm hoping enough emails keep trickling in, but if not I am going to go on a "google" search. I'm sure there have to be some sort of prayer pages out there? But it's really sad that I have to even do that. I know people that I KNOW either need prayer or have to know someone that does!! Just shows me how few people care enough to join me on this little journey. Errrrr :( Oh well .... I have enough for a few more days. Hopefully word will get out and people will send me more requests. If you have one please EMAIL ME ((simplystacyfitness@yahoo.com)) -- include details of diagnosis, persons name, any other details you can about condition/reason prayer is needed and also include and a picture if possible! Okay .. moving on! We have someone for today's PREP WITH PURPOSE that needs URGENT prayer! THEY ARE HAVING SURGERY TODAY!!! I don't know much about Katie except that she is young and beautiful and works for a women's ministry. Life is obviously just beginning for her. But a few short days ago her young life flipped upside down. She was told that she has THREE BRAIN TUMORS! 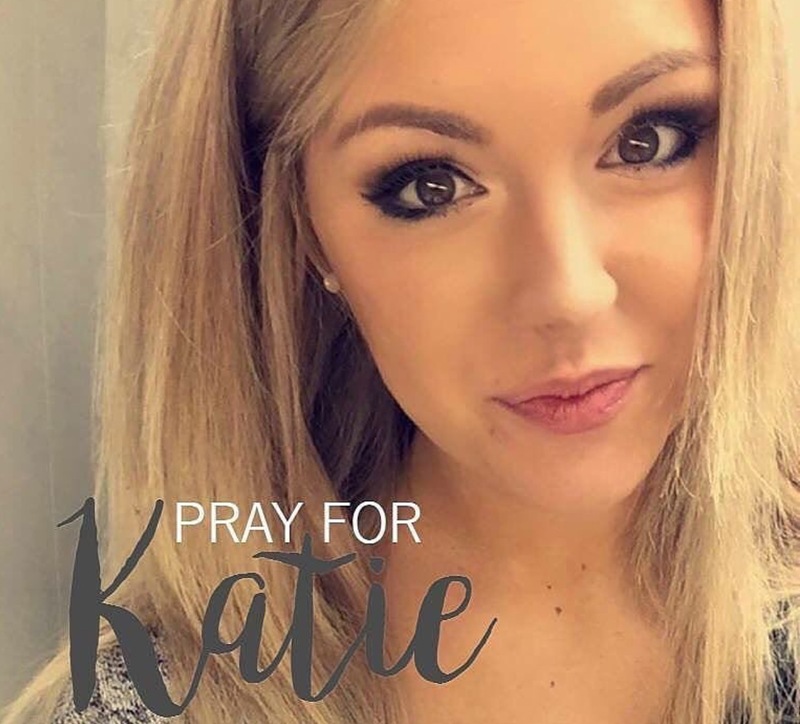 Obviously Katie and her family are in shock and very scared, but they have to be very aggressive in order to have a chance at beating this, so treatment must begin NOW! In fact, she is having her first surgery TODAY!!! It will be to remove one of the more shallow tumors. Doctors want to then push forward quickly and as long as she is well enough they will go ahead and do a second surgery on Monday. Somewhere in this horrible mess she will also have to begin chemo and radiation. But right now the urgent need for prayer is for this surgery happening today (Friday) and assuming she recovers well enough .. the 2nd surgery on Monday! As I write this from my hotel room at 3am... I am setting my alarm for 6am. I have to get up EARLY (like 3am Vegas time) to lift today. We are doing a fun little #phamily group workout before a day of educational 1st Phorm training and quality time together later in the evening. This is NOT the norm for me. I know I will not want to crawl out of bed. I will want to hit snooze at least 10 times. I will complain and come up with even logical excuses (like no sleep.) I will likely feel weak and exhausted. But none of this compares to the way Katie must feel today. She is waking up and having a surgery that will hopefully be part of a process that will GIVE her life back. So I will use her story as my motivation. I will pray for her and her family, as well as the doctors and surgeons working on her today. I will lift in her honor. No matter how exhausted I am ... I will not complain! I am ABLE to be at the gym and be physical! Katie can not. She is proof that illness does not discriminate. You can be ANY age and have your good health ROBBED from you. That is why we can not take ABILITY for granted! Katie is a woman of faith and spends her life praying for others. We must give back and now PRAY FOR HER!! She has a strong support system and many people praying! They have even created the hashtag #PrayForKatie. So please make sure you use it if/when you post about today's Prep With Purpose! I hope you are joining me on this prayer journey as I prep for #TeamU on July 1st & 2nd! If you are please post/share and use the hashtag #PrepWithPurpose! Let's get a huge prayer chain going and in the process maybe make the sport of bodybuilding less about "me, me, me" and a little more about helping others! Our motivation doesn't have to come from ONLY ourselves! If you know anyone that needs urgent or ongoing prayer for any physical reason please email me all the information and a picture (or a few) to simplystacyfitness@yahoo.com.